Bob took a turn operating the controls at the Bald eagle camera this morning. He was fascinated by Dad, who brought in three suckers in one hour. Suckerfish are 'rough' fish: generally considered undesirable by humans, they have large scales, fleshy lips, and a 'sucker' mouth that is wonderful for attaching to rocks and scouring river bottoms for food. They spawn in shallow water during the spring, when water temperatures reach between 47 and 60 degrees Fahrenheit. 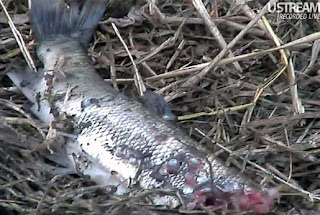 The Iowa DNR tells us that males move upstream in large schools, congregating and defending spawning territories that contain gravel riffles and rubble shoals. While suckers are spawning, eagles are raising a family. Suckers make easy prey: they are relatively exposed, there are a lot of them, they congregate in one area, and they don't leave until spawning is done. "Think about it," Bob said. "We are watching them eat food they evolved with over eons." Bald eagles have several excellent adaptations for fishing. An eagle's powerful toes, locking talons, and spicules - tiny projections on the bottom of its feet - help it grasp and hold slippery fish, as do the serrations on the roof of its mouth. The black pigment on its wing feathers strengthens them against breakage when it dives into the water. Its nictitating membrane and the boney ridge over its eyes - so noticeable in Mom - helps protect its eyes from sunlight and reduces glare. Bald eagles eat a wide variety of prey, but they are fishers par excellence. So how old are Bald eagles as a species? Birds begin to appear in the fossil record between 144 and 66 million years ago. These ancestral birds gradually diverged into separate species. Kites, the ancestors of today's Acciptiridae, emerged tens of millions of years ago. Like modern eagles (but not all Acciptiridae) they are believed to have scavenged and hunted fish. The first eagles descended from kites roughly 36 million years ago, and the earliest known fossil remains that closely resemble the bald eagle date back to about a million years ago. Plio-pleistocene Bald eagles in North America might have shared the landscape with mammoths, dolichohippine horses, camelops, glyptotherium, terror birds, and stegomastodon, as well as more familiar bats, birds, rodents, and fish. Did they build the same kinds of nests? Did they raise their young the same way? Did eagles feed on suckerfish even back then? We don't know: birds don't preserve very well. Still, the thought that Bald eagles flew over an ice-age North America gives me the shivers. So much of what was is gone now, but eagles and sucker fish are still with us. Fast-forward to a shallow stream 15,000 years ago. Suckers are making their way upstream to spawn. Suddenly, an eagle swoops down and hooks one to bring to its waiting young, who are clamoring hungrily in the nest above. Dad has food. His legacy will survive into a future he can't imagine. http://bss.sfsu.edu/holzman/courses/Fall02%20projects/bald%20eagle.html (bald eagle evolutionary history). Nice job, Michael Rochelle! It was fun to read about plio-pleistocene life forms. It reminded me of very loved books from my childhood that I haven't thought about in ages: brightly colored children's science books about the ice age with fantastic illustrations of mammoths, saber-tooth tigers, and so much more. What a treat to think of them again! 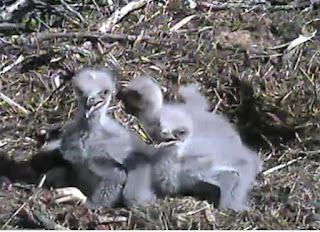 The eaglets in Decorah are 27, 26, and 24 days old. Their darker second down has been in for days, and pinfeathers are beginning to show on the edges of their wings, signaling the emergence of their first juvenile contour feathers. Here is how it works. Each feather arises from a feather follicle in the skin. The pin feathers, or feather follicles, contain undeveloped contour feathers. As the contour feathers develop and emerge from their follicles, they push the down feathers off. The down will remain attached to the contour feathers until it rubs off. Other changes: the eaglets are more proficient at walking and pooping. They are a lot bigger, although their growth curves (when expressed in weight gain per day) will begin slowing sometime in the next three to six days. The overall size of their footpads should already have started slowing down but the growth of their juvenile contour feathers is just taking off : like many animals, parts of the eaglets' bodies grow at different rates. If human children play house, the eaglets are playing nest. We've seen the eaglets tussle with cornhusks, move debris around the nest, nibble on everything from food to mom's tailfeathers, 'attack' prey, and explore. Socially, they spend a lot of time interacting with one another and with their parents: they alternately dominate and cuddle, observe Mom and Dad (especially when food is involved), and 'help' with nest chores. This behavior is all part of their growth and development. We sometimes think of play as being unimportant or trivial, but play lets young animals 'practice' the skills they need for adulthood, cements bonds between players, and is pleasurable to those playing. Sherri Elliott's daily 'Whattas' on our facebook page provide a wonderful round-up of eaglet daily and developmental events: https://www.facebook.com/pages/Raptor-Resource-Project/103786266324668?sk=notes. I wasn't able to find any information on Bald eagles and play, but here are some play links worth looking at. I think we should all get out and play after this post is done! We've been asked how soon we can tell if the eaglets are male or female. The short answer is that we can't tell for sure unless we capture them and take measurements or a blood test. Having said that, Gary Bortolotti notes that sexual dimorphism begins to appear in some variables after 20 days of age. Initially, size depends more on hatch order than anything else, but after 20 days, gender begins to play a role. Females are bigger than males and have correspondingly wider wingspans, bigger feet, and thicker tarsi. Without proper measurements we are speculating, but speculation is part of the fun. Bob is anticipating that fledge will happen mid-June: a little less than two months from now. Over the next few weeks, we'll see the eaglets get bigger. Dark brown juvenile feathers will replace their fuzzy grey down and we'll see even more wingercizing and play as they transition from nestlings to flighted hunters. Have fun watching! We are also waiting for the Great Spirit Bluff Peregrine falcon nest to begin hatch on May 2nd, and the Turkey vultures to lay sometime between May 1 and May 7. There will be a lot to see, laugh at, and learn from. Discover Magazine Q&A with Jaak Panksepp, Rat Tickler. We've heard a lot of concerns about weather from nest watchers. Following the nicest March anyone in the American Midwest can remember, we've had tornado outbreaks, high winds, damaging storms, large fires, and snow. 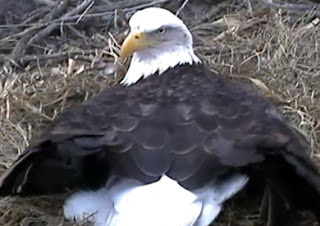 The Decorah Bald eagle nest has been tossed around by wind, the Fort St. Vrain eaglets died of exposure following a spring storm, and the Dairyland Power Genoa cam was damaged by lightning. We get asked daily if we can't do something about the weather: shore up nests, build roofs, and even take young birds from their nests. The short answer: No. I wrote about intervention in an earlier post. We intervene in the case of obvious, acute danger, but weather is a chronic condition that all of us have to live with. High winds, severe storms, and fire are nothing new. If animals couldn't survive them, they wouldn't be here. The birds we watch are well prepared for the weather challenges they face. It's Cold and Wet! Feathers are wonderful insulators and adult Bald eagles have roughly 7,000 of them. Light and fluffy down feathers trap air, while flight feathers hook together like a zipper, forming a continuous 'vane'. 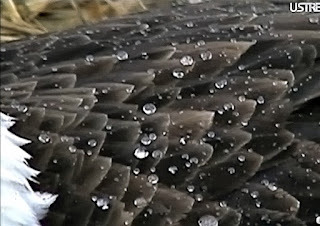 Preening releases an oil that coats the outer layer of feathers, which further protects adult birds from moisture: the outer feathers may get wet, but the bird's body does not. We've watched the adult eagles shake off rain and sleep under a blanket of snow. They are well prepared for cold, wet weather. 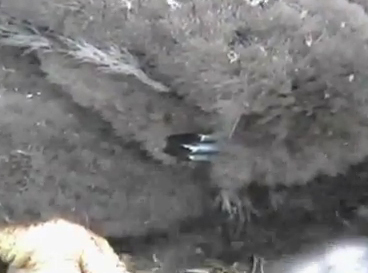 As of this post, all of the Decorah eaglets have their second down. Unlike the first fluffy white down, the 'wooly' second down has insulative properties. Mom and Dad will still protect the eaglets from rain and snow, but they are able to thermoregulate now. It's Hot! We've had a lot of questions about panting this spring. Like dogs, eagles don't have sweat glands. They control heat by panting, radiation through their unfeathered legs and feet, and perching in the shade. March was unusually warm and the cottonwood doesn't leaf out until April, so the eagles spent a lot of time in direct sunlight. We also got to see a little more of the eaglets than we usually do: many cam watchers commented on how lively, naughty, and busy this year's brood has been. The dry, hot weather means that the eaglets spend more time exploring the nest than huddled under Mom or Dad, and everyone spends more time panting. It's Windy! Adults and young hunker down against high winds and storms. Some of their behavior appears instinctive and some is learned. The first year Mom nested here, she turned tail to the wind and was blown out, nearly taking a young eaglet with her. That hasn't happened since. The adults minimize their profiles during high winds, keeping wings tucked in, tails low, and young birds protected. Young birds curtail nest exploration and play, sheltering under Mom or Dad until the wind dies down. When the adults do get pushed around by sudden wind gusts, they don't grab at the eaglets, and the eaglets are not especially aerodynamic at this point. 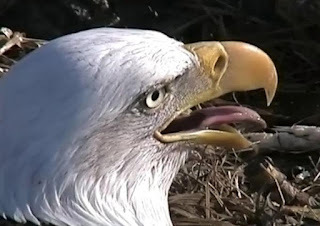 We've also heard from watchers concerned that the Decorah Bald eagle nest will fall/has fallen. The nest weighs approximately 1300 pounds, is tightly woven of strong wood, and is wedged securely into the limbs of a cottonwood tree. The tree is healthy, with no large dead limbs, and near a good water source. Can we say that the nest will never fall? No. But is it likely to fall? Also no. The nest is very secure and the tree is healthy and relatively secluded from wind. If the nest or tree did go down, we'd be on site as quickly as we could. In short, we can't do anything about the weather. Fortunately, the birds we watch are equipped to survive it in all but the direst cases. The Decorah nest in particular benefits from an ample food supply, experienced parents, and a relatively sheltered location. Last year, we watched them respond to cold weather and late snowstorms. This year, we've watched them respond to warmer, windier conditions: they've spent more time off the eggs and young babies, and their 'hunker down' time has been more likely to be a response to wind than rain or cold weather. Our forum members. Thanks for your notes and caps! If you would like to learn more about how animals survive cold weather, I highly recommend Winter World: The Ingenuity of Animal Survival by Bernd Heinrich. If you would like to know more about animals in summer, I highly recommend Summer World: A Season of Bounty, also by Bernd Heinrich. We are sorry to announce that the Fort St. Vrain eagle nest in Colorado has failed. A violent storm soaked the nest and remaining two young, who died of cold. This is the second time this has happened at this nest, which is in a remote and hard to reach area. This brings up some questions we are often asked. When is it right to intervene in a nest? Is it ever wrong to intervene in a nest? How do we decide when to intervene? Intervention isn't always possible. Neither the Fort St. Vrain nor Decorah Bald eagle nests can be easily and safely accessed once babies are in the nest. A bucket truck isn't an option and we can't shoot a line. Those of you who watched Decorah in 2011 might remember the saga of the dreaded red twine. None of us wanted to watch an eaglet die from gangrene or infection, but going up to the nest could have resulted in the death of one or more of the eaglets if they were hit by a bolt or jumped from the nest once we intruded on it. Sometimes we can't intervene. It isn't always clear when intervention is needed. Several years ago, a female falcon named Alma died after hatching five babies. The babies were 20 or so days old - far past needing brooding. We debated at length whether to go up and retrieve them. Since Dairyland Power Alma can be remotely monitored, we decided to let Dad try raising all five. He did a wonderful job and all five fledged without intervention. Many things that might seem to us to require intervention - a parent dying, things that go bump in the night, loud noises, hungry babies - are a regular part of life for the birds we watch. Intervention isn't always necessary. However, intervention is sometimes both possible and necessary. We give Spartrix to nestling falcons when they have Frounce. We do our best to create raccoon-proof nesting sites for birds - eagles and falcons can handle most challengers, but raccoon are a serious problem. We recommend putting grounded young birds in a high place, safe from traffic, people, and other animals. When it is possible and necessary, we intervene. Death is part of the natural order, but that doesn't make it any less sad when it happens. I am glad that the rest of our Colorado nests appeared to have made it through. We watch these animals and love them, but they belong to no one but themselves. Their lives are a gift we are privileged to share. How Do I Recognize the Difference Between Nestlings? We're getting questions in chat, facebook, and via email about how to recognize one Decorah nestling from another. We've got some information here: many thanks to ThinkingWoman, Tekon and Birdsohio for the information and help! Looking for the clues that distinguish one nestling from another is like trying to looking at the difference between little brown bird A and little brown bird B. Subtle differences make all the, well, difference. Other clues (the type of down and emergence and length of pin feathers, for example) can provide clues about the bird's age. Training yourself to see these differences will not only help you identify D12, D13, and D14, but will also help greatly with bird identification in the field - even if the field is your bird feeder or computer screen. Size. As time goes on it may be more difficult to note size differences. Initially, those differences will be based on age. Once the eaglets achieve full or close to full growth, size differences will be largely gender-based. Even within the context of gender, however, there will probably always be at least subtle size differences. In Bald eagles as in other raptors, females are larger and males are smaller. Coloring. Actual colors will be similar, but shades of the color may be quite different. Look for patterns of light and dark, and any identifying marks. Type of Down. Does the nestling have natal down (white and fluffy), or the thicker wooly secondary down also called thermal down? More information on plumage stages can be found here: http://www.swbemc.org/plummage.html. Pin Feathers. Are pin feathers starting to come in? Note the location of emerging pin feathers. We've used pin feather length to help identify the age of young peregrine falcons when banding them. Hairdo. This is one way we learned to differentiate nestlings last year. Does the eaglet have a crew cut, a mo-hawk, or an Elvis-style hairdo? Are the eaglet's "bangs" straight across, or do they come to a single point, or is there a double point like an "M" or a "W"? Facial Features - Around the Eyes. Look at the area around the eyes - do you notice a streak or a dot, or a dark mask as contrasted with a lighter mask? Facial Features - Beak Size and Coloring. Does one eaglet have a larger beak as compared to the others? Look at the coloring on the beak. Is the beak tip dark, or perhaps the darker coloring extends to mid beak. Leg Coloration and Foot Size. What color are the eaglet's legs? How big are its feet? Is there anything noticeable about the talons? We've seen blue-legged and white-taloned peregrine young. Color differences can provide a valuable clue. Behavior: Is this a noisy or a quiet eaglet? Is this a busy eaglet or a lazy eaglet? Does this eaglet prefer to rest alone or with a sibling? What nest area does the eagle frequent the most? All of these behaviors can provide identification clues. Learning observation skills may help you to be a better ornithologist or biologist or scientist - or simply help you identify birds for own pleasure. On May 1st, 1805, Lewis and Clark identified a plover for the very first time. Click here to read a little about their observations. Here are some observations that might help identify D12, D13, and D14. See if you can spot them, or share your own in the comment section. Of course these are my observations on April 10, 2012. Yours may be different. At the rate they are growing, mine will! Has a 'sad-looking' beak that stops midway of eye. Has a ^ above the blackening of the eyes. Has a skinnier neck than D13 and is whiter for now. Has a more messy look of blacking around eye. Has a 'drip' under left eye. D13's beak goes back to back of eye, and has a jiggy-jag to it. Is getting larger than D12. Is the smallest so far.